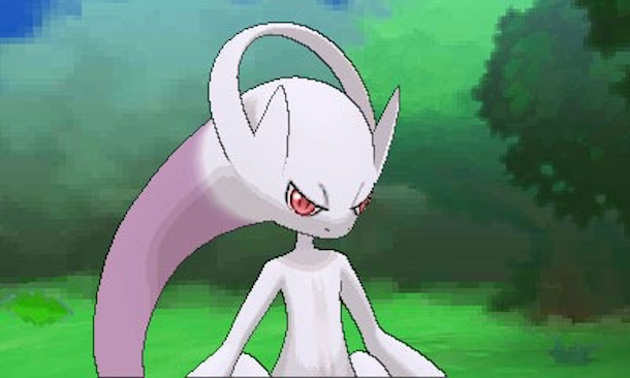 In a quite shocking turn of events, Nintendo has revealed a new Pokemon–one that looks uncannily related to the classic Pokemon Mewtwo. It is unclear at this time if it is a new Pokemon entirely or an alternate form to the famous monster. Nothing else has been revealed, including its name and typing. Every few years, the power couple that is Nintendo and developer GAMEFREAK ushers in a new era of their uber-franchise, Pokemon. For nearly two decades now, the series has introduced a horde of games and nearly seven-hundred of the titular pocket monsters. The most recent ‘generation’ of Pokemon games, Black, White, Black 2 and White 2, were critically acclaimed for moving the admittedly stale franchise forward in an exciting and fresh direction. It now seems that the Pokemon franchise is moving forward once again. Pokemon X and Y have been announced for a simultaneous worldwide release sometime this October. This 6th generation of Pokemon introduces some truly huge departures for the series, as well as more Pokemon to catch, train and battle. 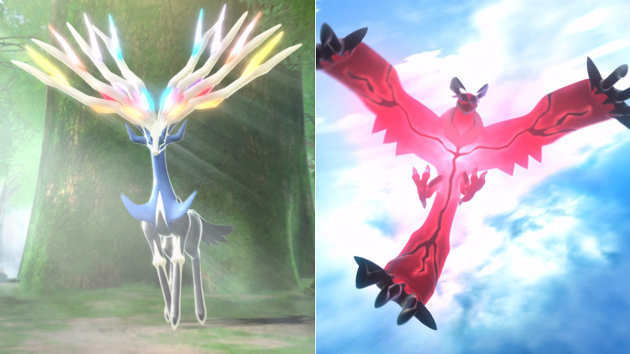 Pokemon X and Y will have fully-realized 3D graphics. The series will no longer be sprite based, as it has been done since the original games, Red and Blue. Everything, from your player character to the Pokemon themselves, has a unique character model. Despite this, movement in the field appears to still be grid-based. That means your player character will only move up, down, left or right, with no diagonal movement possible. Battles are also fully realized. For example, Pokemon will react to being hit by certain moves. This builds on the previous generation’s gameplay enhancements, with Pokemon having moving sprites during battle. Attack effects have also been enhanced and look even more dynamic than ever. The environments in which battles take place are even fully three-dimensional. Pokemon X and Y will be exclusive to the Nintendo 3DS, and unavailable for any incarnation of the Nintendo DS. Both games will be available to download directly to the 3DS via Nintendo’s popular e-Shop application. It should be noted that this is the first time a Pokemon game will be available at the same time in Japan as the rest of the world. This means Pokefans across the world can experience the new games together. This new, dynamic world looks to be very detailed and very fun. Pokemon X and Y will be set in a new region, the name of which is currently unknown. It does appear to at least be inspired by Europe (more specifically, France) the same way the previous generation’s region, Unova, was directly inspired by New York City. Pokemon X and Y will return to the series norm of including older Pokemon along with brand-new ones in the main part of each game’s story. In Black and White, by contrast, the player couldn’t even witness Pokemon of past generations until finishing the game’s main narrative. These three constitute this new region’s starter Pokemon. 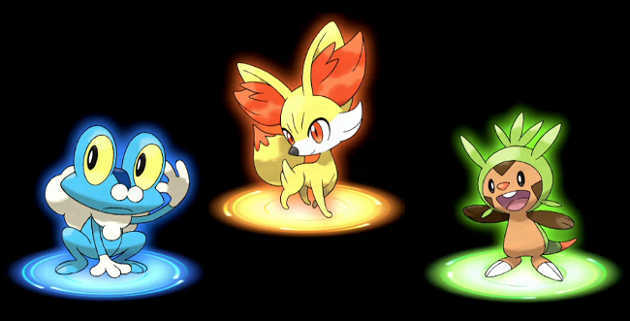 Like all starter trios in the Pokemon series, they are typed as Water, Fire and Grass respectively. These are the only new Pokemon whose types are officially revealed. At this time, there has been no official reveal of each starter’s evolution family. Chespin appears to be based on a hedgehog and/or porcupine, making it the first Grass-type starter to not be reptilian. Fennekin most likely uses the real-life fennec fox for its inspiration, while Froakie is obviously based on a frog. Arguably the most controversial new Pokemon so far revealed is Sylveon. It is the newest in the ‘Eeveelution’ family of Pokemon, or different creatures that share a common base form in the classic Pokemon Eevee. Due to their designs, this collection of Pokemon is incredibly popular, and Sylveon is already forming a fanbase all its own. Like Xerneas and Yveltal, its type has not been officially revealed. Little is known about Pokemon X and Y, but the games are already shaping up to be nothing short of revolutionary. As the October 2013 release date approaches more information will be made available. Keep it here at inMotion Gaming for Pokemon X and Y news updates you can trust. That being said, I think Chespin is the coolest starter out of the new three, by far. Disagree? Let us know which your favorite is in the comments below!